The instructions below explain how to set up the various recording modes of the Nuuo Main Console DVR / NVR surveillance system. Nuuo Main Console comes pre-configured to record around the clock but can be configured to record based on a schedule as well as motion detection. 1. Launch the Nuuo Main Console. Then enter the Username and Password. 4. 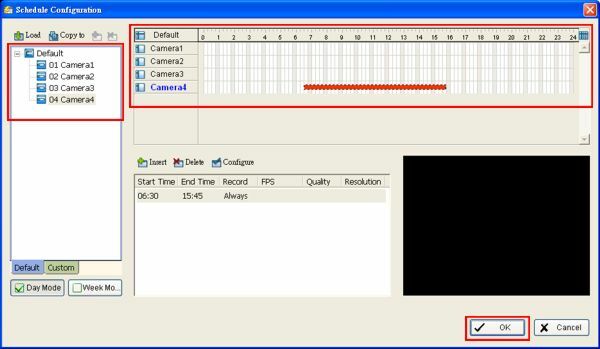 Click OK to save the settings and return to the main screen once you have configured all of the desired cameras. 3. Under the Mode section, select Record on Motion. Then select your desired Sensitivity and Frame Interval. Now on the left video square, left click and drag to define which areas you would like motion to be detected (There can be up to 10 fields per camera). Click OK once completed. 4. Your camera will now record only when motion is detected within your preset schedule.